Working at Die Etage in Berlin Germany allowed me to explore some truly exciting work with my students. During my time there I had the opportuntity to direct three shows. 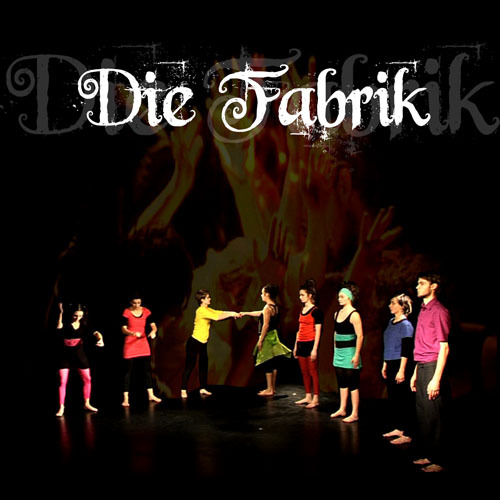 "Die Fabrik" represents 4 months work with the graduating class of 2012 in the Physical Theatre and Mime Department. "Hunting Party" (aka "Berlin Berlin") was a three month project I created with the students of the Circus Department and "When Push Comes to Shove" was the show I did with the Acting Department based on stage combat. 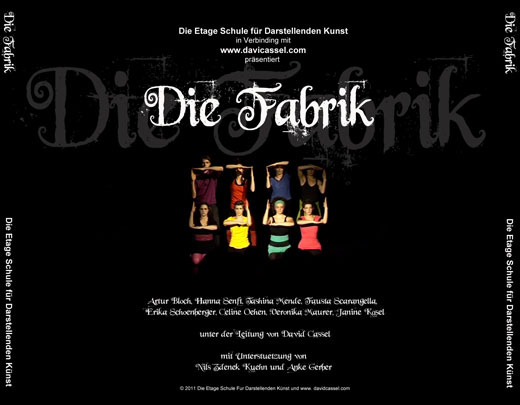 This is a show I directed for Die Etage, the Performing Arts School in Berlin, that was presented at the 2012 European Federation of Circus Schools Conference. 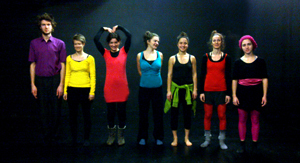 It was the first time any of the circus students had been given a context for their performances. The story revolves around a young clown who has a map to a party. On his way there he encounters others who are going to the same event, so they team up to make the journey more fun. The people of the village all have a role to play in keeping the local factory operating. The Factory is the heart of the village. All daily activities revolve around it, the life it provides and the product they manufacture. But who are the people? What do they do at work and at home? How do they relate to each other and, ultimately, what is the product that they are making? How do the people respond to tragedy when a disaster engulfs their village. Will they find hope, rebuild and start again? The Factory is an exploration of the human condition. The juxtaposition of management to worker, clerk to client, parent to child, among others, serves to strip away the mystery of how this factory works and why. It explores a variety of struggles, both of a personal and interpersonal nature. A short detailled study using manipulation, fixed point and dynamic to explore a single act of effort and introduce the players. The story begins with all of the villagers running away in slow motion from an explosion. It is during this scene that we see the extremes of selflessness and selfishness portrayed as each villager attempts to save themselves or others from being crushed. We see the best and worst of people. In this study of character, mood, transposition and style, we move backwards in time to a sunny morning on a village street. The Characters are introduced and relationships are established. We see a wide variety of characters and scenes that include, but are not limited to, the Factory Manager, a pregnant woman, several workers, market vendors and a street performer. After much joyous activity, we hear the bells, whistles and horn that are the daily call to work. The villagers make their way to the factory in single file, check in and begin to work. An assembly line is created and it becomes apparent that what ever is being made is "top secret". During the scene the characters become cogs in a great machine. The day passes without incident, the horn blows and the villagers exit the factory. Each of the characters eventually appear in a local tavern where they sing, drink and try to impress each other by doing short performances. Eventually they all join together in a dance about working and making money until, one by one, they leave to go home, sleep and get ready for the next day. Two of the villagers, the last to leave, stay too late and become horribly intoxicated. They eventually stumble home, making noise and waking people up along the way. They cause some minor damage. The horn sounds and the villagers go back to the factory. The two drunk characters from the previous night are hung over and not feeling well. They are moving more slowly than the others and are having trouble focusing on their jobs. Their inability to keep up begins to cause problems. Eventually they are involved in a major mistake and the machine malfunctions. There is a chain of events that sees an explosion occur. We revisit Scene 1 as the workers run from the explosion. 2. Slo Motion Study "Impact of Force on Body"